"When you donate... You become a part of the Racine Zoo community. People who care..."
Create a lasting impression as a gift or in memory of a friend or loved one. 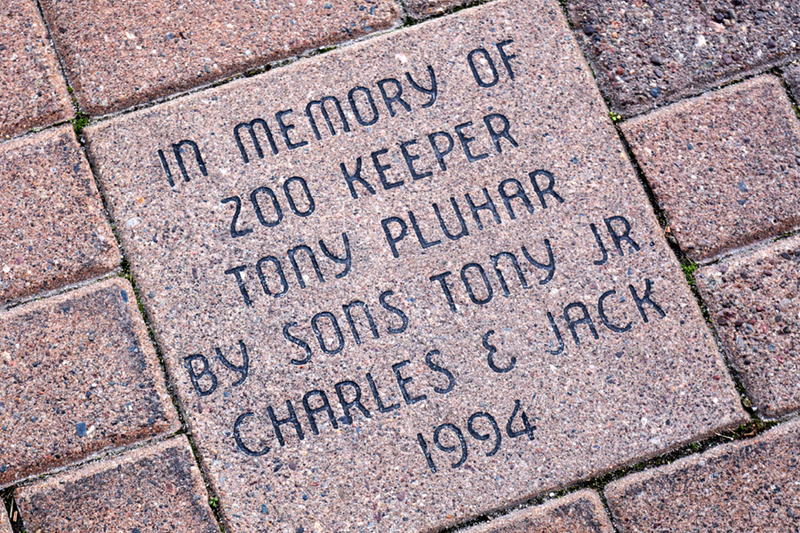 Your brick will leave a permanent message for all to see in the brick walkways throughout the Zoo. Plant a memory to last a lifetime. By purchasing a tree, it will include a rock that can be engraved with your own personal message, quote, poem, or significant date. Each rock can accommodate up to 15 characters per line and up to three lines of text. Every time you visit the Zoo you will know that you have left a lasting impression for all to see. The Racine Zoo sits on 25 beautiful acres of land. We need comfortable areas to give our guests relief from tired legs and feet. Benches are strategically located throughout the Zoo, giving guests some of the most scenic views on campus so they can fully experience the tranquility of the site. You can have your name or the name of a loved one engraved on a plaque that will be affixed to your own Racine Zoo bench for the community to see and enjoy for decades to come. Call 262.636.9189 or e-mail info@racinezoo.org for more information.